Edinburgh, Scotland, and London, England. Publisher: For the Proprietors, Oliver & Boyd, Edinburgh, Geo. E. Whittaker, and Taylor & Messey, London; John Anderson. Editor: Richard Poole; then George and Andrew Combe, James Simpson, Robert Cox; then Hewett Cottrell Watson; Robert Cox. The journal announced in its first issue that its goal was to correct the ignorance of the educated public who had not "yet formed an adequate conception of the real nature, the cogent evidence, and the vast importance of phrenology." 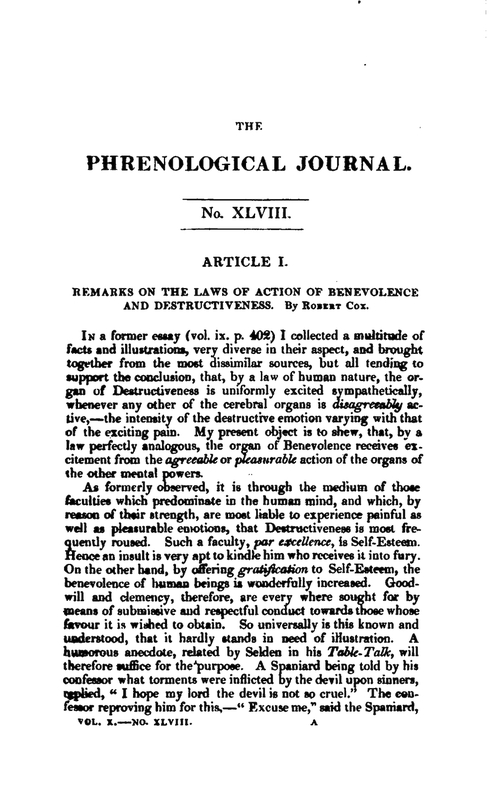 Specifically, the journal sought to overcome the prejudice displayed by the Edinburgh Review in judging phrenology by its source -- Germany -- which at the time "was in doubtful repute in this country, because of some alleged fantastical speculation, not a little moral heresy, much literary extravagance, and a great deal of quackery." The brothers Combe -- George, a lawyer, and Andrew, a physician -- had started the Edinburgh Phrenological Society in 1820 to spread their belief in phrenology. When debated at the Royal Medical Society on the subject and the society refused to publish his arguments, the Combes started this journal. It existed until 1847, mirroring the interest in phrenology at the time, and the society continued until the 1870s. The journal chronicled the internal debates (Christian vs. materialist, physiological vs. mystical) within phrenology and the spread of the idea throughout the British Isles, but mainly consisted in lengthy discourses on various elements of phrenology. LOC; NYPL.